Two of our good friends grew up in Chesterland, Ohio, and they have played the role of our tour guides for that area over the years. That led us to a meal at Guido's Pizza Haven earlier this year, and last week, they brought us to Oak and Embers Tavern. It had been on my restaurant radar for a while now, but it really started to get people talking after it was featured on chef Michael Symon's new Food Network show "Burger, Brew & Q." Good BBQ food is hard to come by in Cleveland. Near impossible. But, I'm happy to report that this was one of the better traditional BBQ meals that I've had in the area, and we left quite happy and stuffed. With a ton of leftovers that lasted me two lunches. They have a selection of small plates, soups, and salads to get you started. However, our crew of six went right for the Smoke That Meat section of the menu. I was thrilled to see a Pick Two or Pick Three Combo, because, how was a girl to decide?! I did the Pick Two Combo ($22) with two meats and two sides. I ordered the Pulled Pork and the Baby Back Ribs. Picking two sides was difficult, because I seriously could have made a meal from the tempting choices. I ended up with the Mac & Cheese and Baked Beans. Each platter comes with Cornbread. I don't think that this photo does the size of the portions justice. I mean, look, it's served on a platter, not a plate. I thought that the BBQ sauce on the pulled pork and ribs (same) was very flavorful without real heat to it that would turn off people that don't care for spicy food. The meat on both was tender, and not dry. I would have liked a more distinct rub on the ribs, but that's personal taste. The sides were tasty as well, but I could have used some butter for the cornbread. They also have a decent craft beer list, which immediately won points with me. Although, they had changed a tap out without correcting the menu yet, and the Founder's Breakfast Stout that I was pumped to order wasn't available any longer. I found a replacement in the list of bottled beers, and all was well. Overall, we left in a food coma, with to-go boxes, and an even better impression of Chesterland than before. It helped that we then stopped in at Red, Wine, and Brew (almost next door) and picked up some excellent bottles of craft beer, including my favorite...Big Bad Baptist from Epic Brewing. Seriously, I'm addicted. Between the food and brews, it was well worth the drive over to the far east side! Who does your favorite BBQ food in the Greater Cleveland area? Mr. H and I found ourselves near the Berea Union Depot Taverne on a recent Saturday at lunchtime, so our curiosity drew us in for a bite. My brother-in-law had told Mr. H about it, since our nephew loves trains and gets a big kick out of dining at the Taverne as trains roll by. This casual atmosphere is serving upscale pub fare for reasonable prices. All sandwiches are under $12, and entrees range from $14 - $21. Very family-friendly food, and there's something for everyone on the menu. The Berea Union Depot was established in 1876, and if you're dining in the Taverne's main dining room, you're actually eating where the train platform used to stand. The still-active train tracks are just feet from their patio. Unfortunately, the food did not live up to the fun and historical setting. I ordered the Beer Battered Perch sandwich with yellow perch fillets, "house" beer batter, lemon garlic tartar, shredded lettuce, tomato, house slaw, and a brioche bun ($10). Served with a side of fries. The sandwich was dry, and so bland that I was seriously missing any hint of "lemon garlic tartar." The bun was stale, which didn't help. At least the fish was lightly breaded, which was appreciated. Also, I discovered that I really don't like pepper on my fries. These were heavily peppered, and it turned me off. Personal preference, but I'll just stick to salt. And malt vinegar. Mmmm, now I'm craving good French fries. At least the bill was relatively cheap, and we were in and out pretty quickly. Service was fine, but they only had two additional tables of diners at the time. Fun location, and great use of a historical building, but I don't think that the food will bring us back. Not worth the stop. Mr. H and I have been trying to soak in the last days of sunny weather in Cleveland before the grey skies settle in. That quest recently took us down to The Flats for lunch. 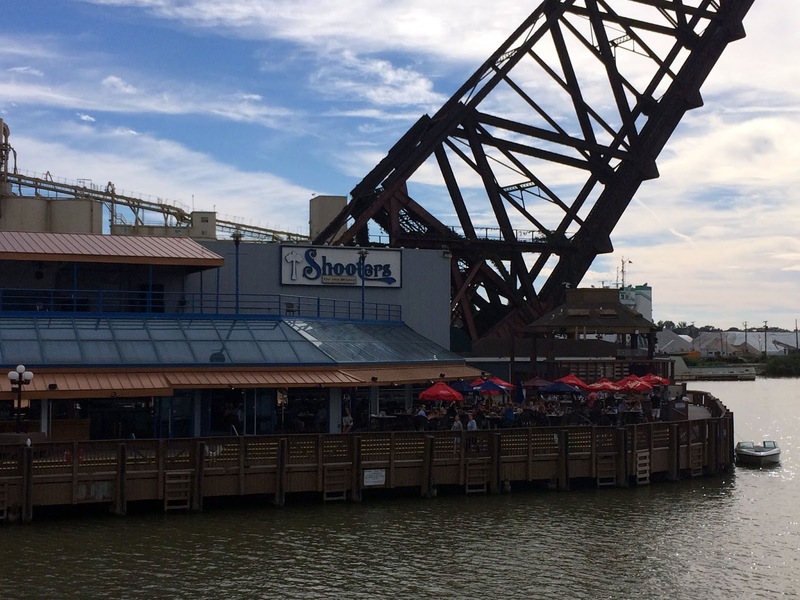 Thankfully, we have several new restaurant options along the river. But, we decided to head to Shooter's on the Water. Sadly, even the views can't save the food there. Isn't this the most depressing-looking plate of fish tacos that you've ever seen? Not only were they bland, the filling didn't even come close to the size of the tortilla used, and the tortilla was stale...but they left a funky after-taste behind. Never a good thing. Mr. H had a Cuban that was much better than my tacos, but still never worth returning for. What a waste of waterfront space. The placement and atmosphere have such potential. I would have been content with even average food, but those tacos were downright nasty. It's Cleveland Beer Week! It kicked off on Friday, and Mr. H and I plan to hit several beer-related events this week. The seventh annual CLEVELAND BEER WEEK takes place from October 9-18, 2015 and features 350 keg tapping, beer sipping events throughout greater Cleveland. From special tappings, tastings and dinners to leisure activities and educational programs, there is something for everyone at CLEVELAND BEER WEEK. We've attended many of the events over the years, and we have some favorites. I never miss Stout Night at Deagan's Kitchen + Bar in Lakewood. Also, we enjoy the flagship event BREWzilla at the end of the week. It allows us to sample hundreds of different beers in one place. My brother will be in town visiting this week. Lucky him! 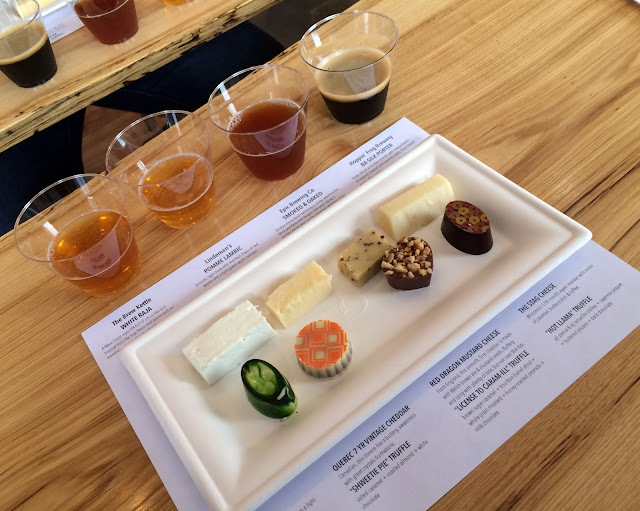 We kicked off this week of beer appreciation with a Beer, Cheese, and Chocolate Flight at Lilly Handmade Chocolates in Tremont on Saturday. I wish that they did this year-round! The truffles and cheeses were expertly paired. 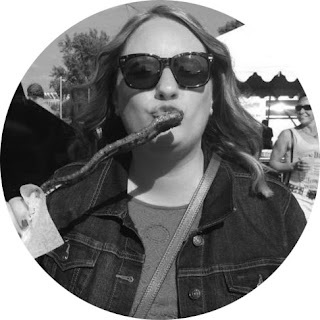 A little bite of cheese, a little bite of chocolate, and then wash it all down with a sip of beer. This particular event is taking place all week, so stop in to their adorable shop on Starkweather. They are also serving beer floats. So, what Beer Week events will you be participating in?